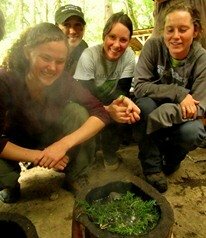 Study wildlife tracking in Africa with expert South African trackers! 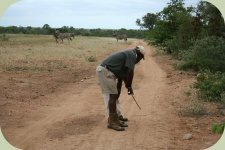 Join us for this unique tracking expedition and opportunity for intensive training on African wildlife, track and sign interpretation, and trailing skills. Learn under the guidance of senior tracker, Adriaan Louw of Eagle's Wing Bushskills, and Track & Sign Specialist, Mark Stavrakis of Limpopo Field Guiding Academy. Gain hands-on field experience tracking antelope and a variety of other African animals, that may include lion, leopard, and white rhino, at breath-taking locations including the Mabula Game Reserve and Greater Kruger National Park. The trip also includes the opportunity to participate in an official CyberTracker Track & Sign field evaluation. To register: A $500 non-refundable deposit is required for registration. The remaining course fee is due two months prior to the trip start date. Upon registration, a confirmation packet is mailed that includes detailed trip information, schedules, a gear list, recommended flights, and other travel information. 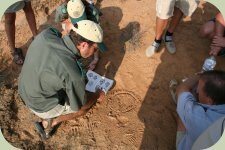 Learn more about tracking expedition instructor, Adriaan Louw in the guest instructor section of our faculty page.